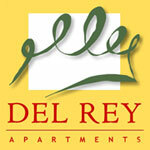 Del Rey Apartments is a well situated, quiet and peaceful apartment complex consisting of 26 luxury apartments. It is a pleasure to enjoy the comfort of this genuine paradise on Aruba. The complex is conveniently located close to beaches, shopping malls, fine restaurants and an 18-hole golf course. Del Rey offers a large fresh water swimming pool and whirlpool. While you relax in the water the children can play in the shallow kids pool or on the playground. Find some respite from the sun by resting under the parasols on our lounge chairs on the spacious pool deck. Your car will be safe in the meantime on our secure parking lot. Your apartment will be air-conditioned and contains a fully equipped kitchen. Our excellent maid-service will clean your apartment daily, and you will find fresh towels in your room daily. In leisure time, you’re free to watch cable TV, surf the internet using our WiFi connection or watch a DVD. If you’re going to the beach, make sure to go to Moomba Beach. There Del Rey guests get one free lounge chair upon showing their complimentary coupon. With the coupon you also get a 10% discount on food at Moomba Bar & Restaurant. You can be assured of a wonderful stay at Del Rey Apartments!